Preheat oven to 425 degrees. Line baking sheet with aluminum foil and spread green beans evenly. 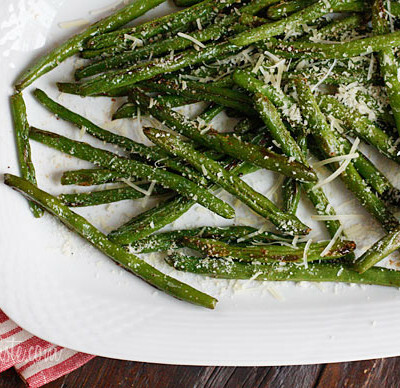 Drizzle olive oil over the beans and sprinkle with seasonings. Bake for 10 minutes, turn the beans, and bake an additional 5 minutes or until tender. Remove from oven and sprinkle with cheese. Serves 4.